This past 4 weeks or so, Levi has loved being the guinea pig for our review of Ooka Island. Why? Quite simple, he LOVES it. I often have to tell him to stop playing. Even better than his enthusiasm for Ooka Island is that I'm seeing measureable learning in his reading skills using phonics that I've not taught him yet. And it is carrying over to into his daily reading! It would be correct to say I'm impressed by this program! Ooka Island is an early literacy program for preK through 2nd grade. It uses technology that advances children individually through a track of pre-reading and reading skills. If the child completes the task correctly, he is advanced to a more challenging level; if he needs more help, he's given a different situation where he/she needs to practice the skill again. This is called the ReaDirect (TM) learning algorithm. No matter what level of pre-reading your child is at (the program is geared for ages 3-7 years), all heroes (as the players are called) must work through the basics of phonological awareness: discriminating the sounds that make up English, understanding the sound-letter relationship, breaking words apart into their sounds and then "smooshing" the sounds back together to make a word (my very technical language). This strategy is called the OokaMethod. By starting at the beginning, you are giving your child a rock solid foundation upon which reading can be built. So what happens when Levi sits down to play? Well, usually I have to kick him off the computer -- that's how much he likes it! OK, so after logging on, Levi's self-made avatar plays through the games for about 20 minutes, after which he gets some free-time to explore games he's unlocked on the island, or read books, or purchase items at the playhouse. If you would like to see all the learning games available on Ooka Island, you can download this quick Guidebook (a pdf) which gives a diagram of the island and explains the learning objectives. At the Popcorn Library, Levi has collected a number of books that are read aloud to him, with words highlighted to help him read along. There are 95 books in all. Right now, he's reading along with narration and highlighted text. As he continues through the program, he'll read with only highlighting, then finally he'll be reading the stories on his own. Each story has comprehension questions (all questions and answers are read to him right now) and selects his response after looking at answers with lots of visual clues. This type of scaffolding is giving him confidence outside of Ooka Island to try reading more and more in our environment. I've been very impressed with how well Ooka Island has held my son's attention over the past month. I like that Levi is "working" for a prescribed amount of time, and then can have "recess" on the island. Usually, he words for much longer than just the one cycle. Reports. In the works is a reporting system so you can see what your child has worked on and their progress. After a month of playing the game, I really have no idea what has been easy or hard for Levi. Graphics. Occasionally some of the elements on the game don't line up or elements disappear for a minute (like Levi's avatar's body), but on another screen come back. Over the course of our trial, these sorts of errors have definitely decreased. Most of the graphic problems have only minimally impacted my son's ability to play the game. Speaking into the Microphone. It might just be us (so please check some of the other reviews out there), but when my son is required to speak into the microphone to say a letter sound, sometimes it seems like it doesn't matter what he says -- the gate opens and he gets to play. I applaud the program for including phoneme production into it's program, but it doesn't always work accurately at our house. Download. This isn't a problem or glitch, but more of a warning. You will be downloading a software program to your computer, but will need to be connected to the internet at the same time. This isn't a big deal for us -- we're always connect. The download is a BIG file: 2 GB! We have high speed internet and it took approximately 20-30 minutes to download. My recommendation: purchase and download when the kids are not breathing down your neck, ready to play. You'll thank me. As I've been writing through this review, I'm been trying to figure out to whom I'd recommend Ooka Island. There's definitely an early-elementary feel to the program -- and my 9-year-old (3rd grade) has said he wouldn't play it because of this. But, if I really had a 2nd or 3rd grader who needed some additional work on phonological awareness and pre-reading skills, I'd certainly consider this as an option. If you'd like a free 14-day trial of Ooka Island, you can go go HERE. To PURCHASE, go to this page. If you have more than 5 students who will use it, consider a classroom option. And here's a coupon code if you do decide to purchase! 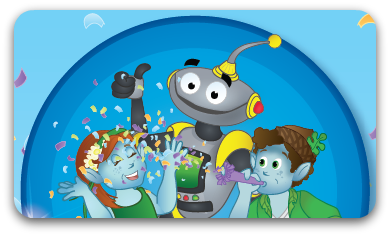 Please be sure to see what other kids and moms (and dads) thought of Ooka Island at TOS Crew webpage! FCC statement: Thanks to Ooka Island for a free trial of their new computer based reading program in exchange for my honest opinions and thoughts.